Parmigiano Reggiano And Saffron Risotto. 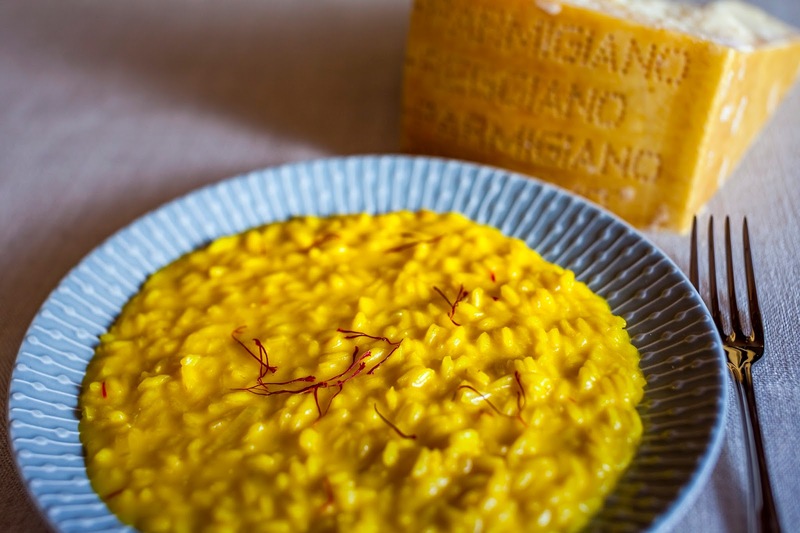 Brighten up your table this summer with a colourful and delicious Saffron & Parmigiano Reggiano risotto. This quick and easy recipe is packed with flavour and is perfect for a dinner party with friends. 1. Chop the saffron pistils and let them dissolve in a bowl of stock. 2. In the meantime, melt 80g butter in a pan, browning the shallot and then add the rice and toast it. 3. Pour the white wine into the pan and leave to evaporate. Once all the alcohol has evaporated, pour 2 ladles of boiling stock to the side of the pan so the temperature of the rice does not decrease. 4. Halfway through cooking, add the dissolved saffron. 5. Once cooked, cream the rice with the remaining butter and grated Parmigiano Reggiano, add salt to taste. Parmigiano Reggiano cheese, known as the King of Cheeses, is one of the world’s oldest and richest cheeses – still produced today as it was nine centuries ago. It’s the only cheese that has such an extensive maturation which develops its delicious flavour and unique characteristics. The use of raw milk and the richness of natural ingredients make this cheese a superior product. A long ageing period is fundamental in building the aromas and texture of Parmigiano Reggiano. Such complexity is achieved in a totally natural way, without any additives, making Parmigiano Reggiano 100% natural, easy to digest and high in calcium. The minimum maturation time is at least 12 months, but only when it reaches approximately 24 months of age, is at its best. Ageing can continue up to 36 months or more, during which time the cheese develops its flavour, texture and digestibility. "Salmon And Kale Filo Pie: Family Favourite Fish Pie"
"Creative Mondays Blog Hop And This Week’s Features"
Sounds tasty. I would like to try this.